Our biggest concern is that sick baby teeth infect the new permanent teeth. This is exactly what will happen because caries is a highly contagious infectious disease. It is accompanied by an unfavorable oral flora and is triggered by bacterial plaque. If a permanent tooth grows in such unhealthy environment, the risk of future caries increases significantly! 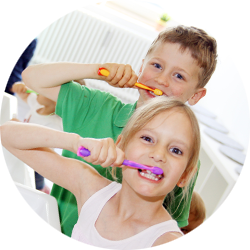 Thorough brushing the nuts and bolts to prevent tooth decay - every child knows this. But despite model toothbrushing, the carious devil strikes again and again. 1) Dental Care and diet are not attuned to the individual risk of caries. Tooth substance: How well is the enamel mineralized? Usually the ugly-looking plaque builds on areas on the tooth, that is hard to reach with the brush. For example, the transitions to the gums (vervical) or even below the gingival cuff (gingival pockets). Our goal is that our patients never get a filling in their adult teeth. Hardly an adult can claim that! If milk teeth are lost to caries before the permanent teeth grow, there is a chance that there might be a deformity in the dentures. Sick teeth can also trigger chronic diseases, because everything in our body is networked in some way or another.